January is National Organization Month so I've been be posting organization tips every day for the during the month of January. I hope you've enjoyed them! You can find all the tips HERE. Since today is the last day of the "31 Days to Organization" event, I am going to list my own favorite organizing tips. Use in kids rooms for toys or books. 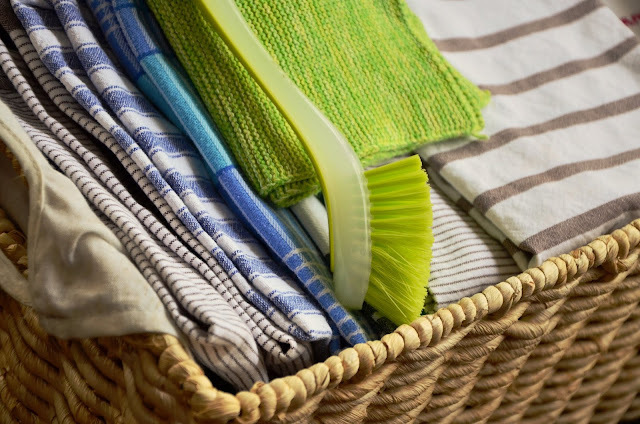 In a mudroom or entryway, assign each person a basket to place items they will need the next day – use labels or colors so you know whose is whose. Hang labeled baskets with each child’s name at the bottom of the stairs or store a basket on each step. As you locate misplaced items around the house, place them in the appropriate child’s basket. They can carry the load upstairs to their room on their next trip. Put a time limit on the basket (i.e. a week) before the contents are given away/thrown out. Smaller baskets can be used in the pantry to hold seasoning packets for gravy, stews, etc. Have a "snack basket" in the kitchen where all the snacks are kept. Magnetic baskets can be kept on the fridge to hold coupons, pens and a notepad, shopping list, etc. If baskets just aren’t your style, try boxes or bins. They come in a variety of materials such as wood, canvas, faux leather and plastic. 2. 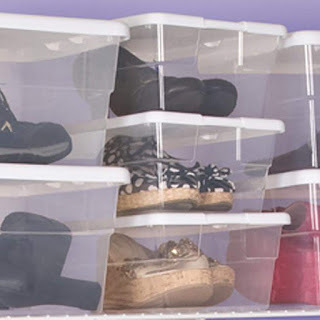 Clear shoe boxes are for more than just shoes! Use them to store small items or collections. Great for crayons, markers, stencils, office supplies, small toys and more. They stack easily and you can always see what you've got! 3. Hang a coat rack lower on the wall so children can hang up their own coats and bookbags. Line baskets below the hooks to store their hats, mittens, galoshes and other bulky items that won't hang from the hooks. 4. Have a container dedicated to storing all your back-up discs, recovery discs and software installation CDs (especially the big ones like your operating system). 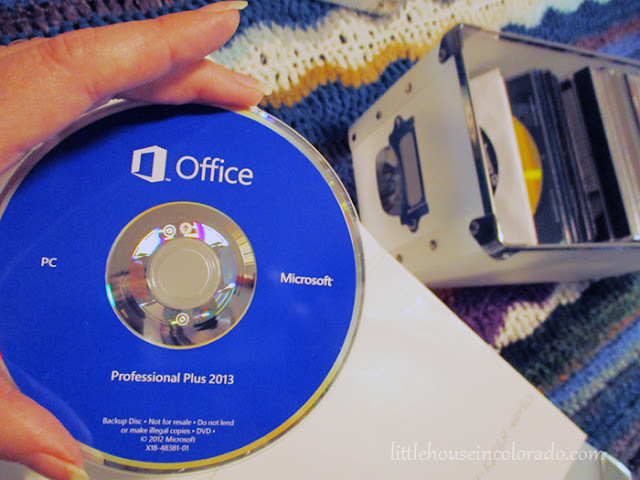 If something happens to your computer, at least you won't have to stress about finding all your necessary installations discs. 5. Twice a year, take a few minutes to check or change the batteries in your smoke detectors. Also, change the air filters in your furnace, clean under the refrigerator, and clean out the dryer vent line. 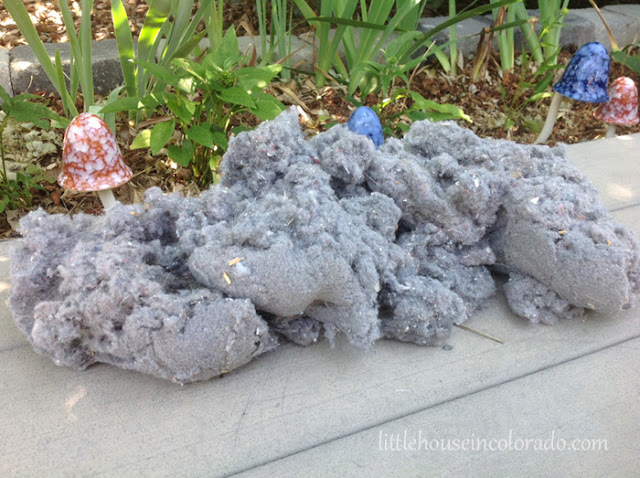 Consider BLOWING out your dryer vent line. Our dryer vents are really long - a serious design flaw in the house. Last summer, our dryer started taking longer to dry - to the point that we considered calling a repairman. So before we made the phone call, Mr. LH and I pulled out the dryer (no small feat in our tiny laundry space) and used our leaf blower to force air into our dryer vent. A huge cloud of lint came bursting out the vent and deposited the massive pile of lint pictured below into our back yard. A neighbor was so alarmed by this information that she immediately . When nothing came out of her vent, she went down to the crawl space to investigate and disassembled her dryer vent line. She removed a HUGE clog. Clean those vents. 6. Always make a shopping list. Stick to the list. And never shop when you're hungry. This keeps your pantry and freezer from overflowing and it saves you money! 7. Type out emergency numbers and post a printout on the refrigerator. In en emergency, I get flustered and can't find information on electronics very easily or quickly. Having important phone numbers posted in a general location has always been much more helpful for me. 8. Keep your keys in the same place. I was the worst when it came to losing my keys, my glasses, my purse, my scarf...everything! MR. LH even got me remotes attached to beeping tags to help me me locate the items. Still, I would manage to misplace the one thing that didn't have a tag. I started putting everything in designated places and life became much easier. 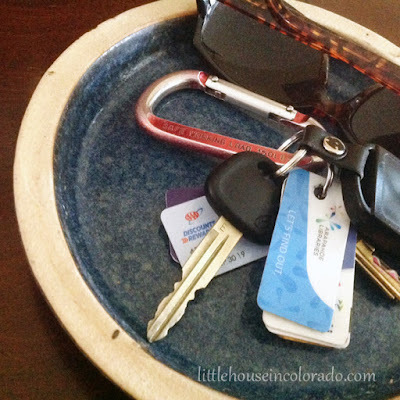 My keys were top priority and I have a pottery dish near the front door that holds my keys and sunglasses (and that's all). As long as I stick to the routine and put them there when I get home, I don't lose them. Whether you use a bowl, a basket, a key rack or just a spot on the foyer table, place them there when you get home every single day. 9. Have a hook by the door dedicated to storing dog leashes. 10. 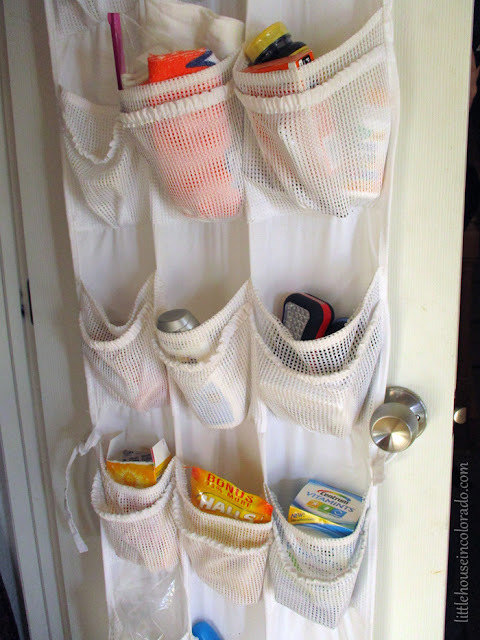 An Over-The-Door Shoe Organizer can be used for so much more than shoes! We have a closet that is both a coat closet and utility closet. The "shoe holder" on the back of the door holds things like band aids, extra vitamins, flashlights and packs of pocket tissues at the top and cleaning gloves, extra vacuum cleaner bags and a tiny dustpan and brush at the bottom. 11. Keep a jar or cup next to the washing machine for all the loose change, buttons and other things that get left behind in the laundry. While you’re at it, establish a “finders keepers” rule for anything left in those dirty laundry pockets (it can be quite profitable). Everyone will quickly learn to empty their pockets while they look for spare change. 12. Be ruthless. If you find yourself saying, “I didn’t know I had that!” or ,”Oh, I had forgotten about this!” then just get rid of the item. You didn’t miss it before so you won’t miss it when it’s tossed out. 13. Up-cycle t-shirts! I use strips of old t-shirts for a lot of things. Mainly, for tying around bundles of cords keeping them tidy. The cotton doesn't cut into the cords and the t-shirt stretches enough to make the hold tight enough. This works for both cords that are being stored as well as the mass of cords and cables that can be found behind desks and entertainment systems. (Just be sure to keep the t-shirt ties away from any live outlets. I also use t-shirt strips in the garden. The fabric is so much more gentle on my plants than string or wire so I am always using t-shirt strips to tie and support my tomato plants or to train cucumber and bean vines up a trellis. At the end of the gardening season, I untie the strips and put them in a mesh laundry bag (usually used for washing delicates) before washing and drying. Then they can be re-used the next season! 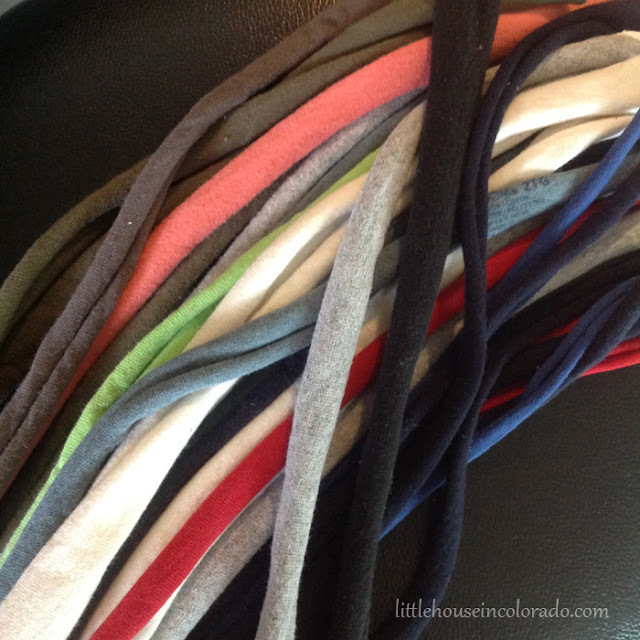 To make the t-shirt strips, cut old t-shirts horizontally into strips about 1.5" wide and 8" to 12" long (you should be cutting along the width of the t-shirt). Then take each strip and holding each end, stretch it a bit. The fabric should curl up and stay curled when you let go. And that's it! 15. Put puzzle pieces in a zip top bag for safe storage. They can be kept in the original box that way, or multiple puzzles can be stored in bags kept in a space saving basket. Donate old puzzles to hospitals to be kept in the waiting room for visitors or used as entertainment for patients. 15. Sort your mail over a paper shredder. I keep a small wastebasket next to the paper shredder. I just dump everything that needs shredding into the wastebasket (credit card offers, anything with names, an address or "approval code", etc.) and then shred once a week or more frequently if needed. 16. 3-ring binder and plastic page protectors - these will organize anything from recipes and take out menus to appliance or toy instruction booklets and warranty information. 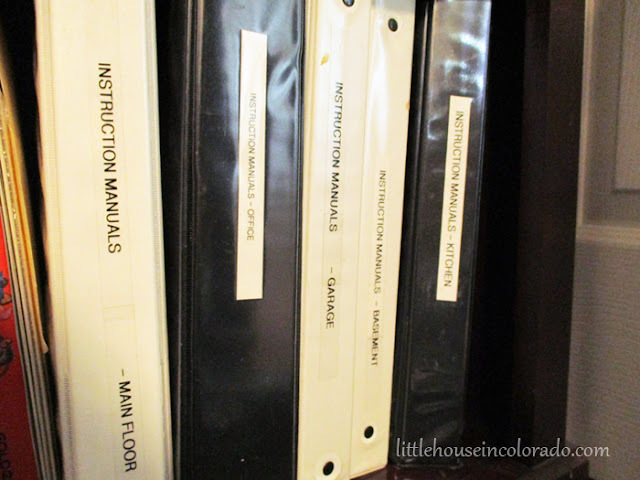 I keep a couple in the kitchen for recipes and several on a bookshelf with instruction manuals (categorized by room). 17. Ice cube trays. I have honestly never used an ice cube tray for organizing drawers, but I ALWAYS use them for freezing things other than ice. And I love using the silicone trays for this. They are easier to get things out of. When I only need a little tomato paste, I freeze the extra in 1 Tbs quantities. When lemons or limes go on sale, I squeeze them and freeze the juice in ice cube trays. Freeze fresh herbs in olive oil. Freeze eggs before they expire (scramble with a little sugar or salt before pouring into the trays and freezing - then pop out and store in a zip top bag. Label the bag so you know if you used sugar or salt and how much. Pesto! I never need the entire recipe amount so I freeze it. The ice cube trays make perfect portion sizes. Take these ideas. Use them. Experiment with them. Find what works best for you. If you think of something new, pass it along! I'm always on the lookout for more organizing tips!